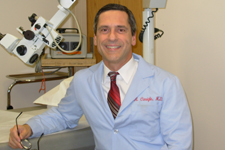 Angelo Consiglio, MD, earned his medical degree from the University of Illinois College of Medicine. Specializing in ear, nose, and throat care, Dr. Angelo Consiglio provides services through a private practice in Marianna, Florida, where he focuses on conditions of the head and neck. A common head and neck condition is tonsillitis, which can have several different causes. Individuals have two tonsils, which are lumps of tissue located in the throat. These lumps play an important role in the lymphatic system, which helps clear infections. The tonsils are meant to trap germs that enter the mouth and the nose. Tonsillitis occurs when the tonsils become inflamed, usually because of viral infections, although sometimes due to bacterial infections. The overwhelming majority of children in the United States will have tonsillitis at least once. Viral tonsillitis is common among young children, while bacterial tonsillitis usually occurs between the ages of 5 and 15. Adults rarely experience inflamed tonsils. Repeated cases of tonsillitis may result in the need for a tonsillectomy. Sometimes, tonsils can become so swollen that breathing and swallowing becomes difficult, which can also require surgical intervention.